Whether you’re getting rid of a single coffee table, a garage full of junk, or clearing out an entire office tower, YYC Junk can help. Short Answer: Pretty much anything, except a few items listed under “What We Don’t Take”. Appliance removal, computer removal, furniture removal, couch removal, chair removal, loveseat removal, sofa removal, dresser removal, TV removal, stereo removal, fridge removal, freezer removal, deep freezer disposal, water cooler removal, coffee table removal, mattress removal and disposal, rubbish hauling, rubbish removal, residential junk removal, commercial junk removal, industrial junk removal, small appliance disposal, scrap hauling, basement cleanout, office junk removal, office moving cleanup, construction debris removal, fence removal, estate sale cleanup, shed removal, garage cleanout, business junk, yard waste removal, branch removal, moving cleanup, and more. Unsure if we can remove what you have? Read on or contact us! Please note that while we will accept small quantities of heavy items, they may be subject to a weight surcharge. Whether you’re getting rid of a few things, or clearing out a corporate headquarters, YYC Junk is the best choice. Find out why! Ready to get rid of your stuff now? Either call us at 403-829-1958 and talk to a friendly representative, or book online by following the link. Get Rid of my Junk Now! Whether you’re a seasoned junk removal expert or novice to having your junk removed, YYC Junk Removal is here to answer your questions. Below are a few common questions we hear every day. If your answer’s not here, just let us know! Do I have to be onsite? No. If we can access the junk that you want removed, we can look at the junk, give you a quote, remove the junk, and take payment via e-transfer or credit card. Can I always get a quote over the phone? While we may certainly try, it is almost impossible to guess the volume of your items over the phone. Every junk removal job is different and to give you the most accurate pricing for your unique junk removal, the YYC Junk team finds that quoting in person, or at least after seeing your junk, is the way to give you this accuracy in pricing. We are a local, Calgary-based business, led by John Nicholby who is highly experienced in the junk hauling business. We are the socially responsible option for junk removal, believing in recycling and repurposing. Prompt, efficient, and very easy to do business with! Heck yes, of course! It’s a matter of legality and integrity! Book as soon as you think about it. It’s important to know that at the beginning and end of the month, the best time slots go quickly as this is when everyone is clearing out their items. If you know you want something removed, do not put it off. Book it ASAP to get the removal time you want. We do our best to donate items our charitable partners or recycle them prior to throwing it away If your junk is truly junk, we will properly dispose of it at a recycler or at a landfill. YYC Junk operates from 8:00 am to 8:00 pm, 7 days a week. If you need an earlier or later pickup, please contact us. If I’m moving, will you move my stuff too? YYC Junk is a junk hauling business and we simply are not equipped or insured as a moving company. If you need your junk taken away, we’re your team! How do I get ready for you? Simple. Know what you want us to take. Let us know what and where it is, and we will do everything else for you. To ensure a quick and efficient quote (and pickup), if you put your junk together in one spot makes it easier for us to give the most accurate quote, but is not absolutely necessary. The YYC Junk Removal truck is 30 cubic yards. This is an above-average size of truck used for junk removal, allowing us to haul more than most companies,while remaining fuel efficient. Don’t worry though, pricing is based on the size of your junk haul, not our truck. Why not rent a junk bin and do it myself? Our prices are competitive with the cost of renting a bin.Think of it this way: if you rent a bin, you pay for any space you don’t use, and you have to do all the heavy lifting yourself! When using YYC Junk, you are saved time, effort, and often, money. No, unfortunately chemicals require special licensing to transport and dispose of. For a list of what we do and do not take, see above. Whether your getting rid of a few things, or clearing out a corporate headquarters, YYC Junk is the best choice. Find out why. Ready to get rid of your stuff now? Either Call us at 403 829 1958 and talk to a friendly representitive, or book online by following the link. We Are Your Glorified Garbage People With Big Hearts. Check our segment with Gil Tucker on Global News! YYC Junk Removal is here to make a difference in the lives of Calgarians. Founded by John Nicholby, YYC Junk is committed to reducing the amount of “junk” in Calgary’s landfills by sorting, recycling, reusing, and donating any junk that we pick up. By taking your junk and repurposing it to those who need it, you are directly having a positive impact on the lives of others! 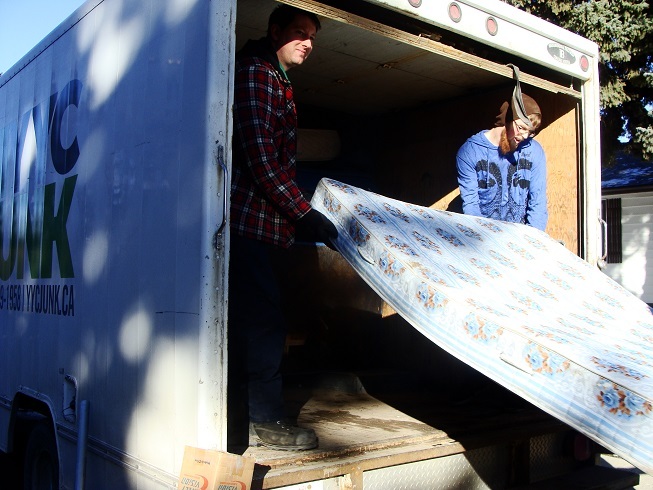 For YYC Junk Removal, it’s about recognizing that one person’s junk could very well be another person’s treasure and giving people the tools they need to feel empowered. Unloading a bed we provided a family in need. 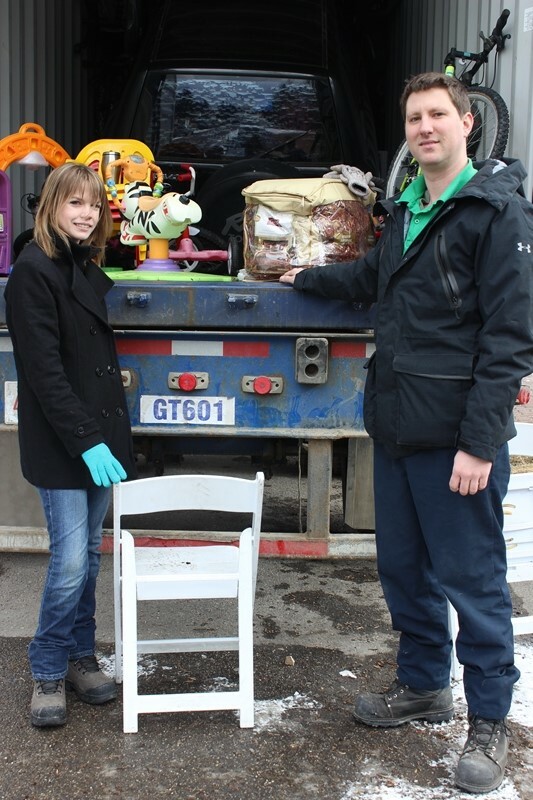 Most furniture items that are still in reasonable condition are distributed to Calgarians who can use them. But please, don’t get us wrong, if it’s truly junk, it goes to the dump! We are guided by a few key values that make YYC Junk Removal unique in the junk hauling and recycling industry. We make every effort to not toss useful items into Calgary’s landfills. 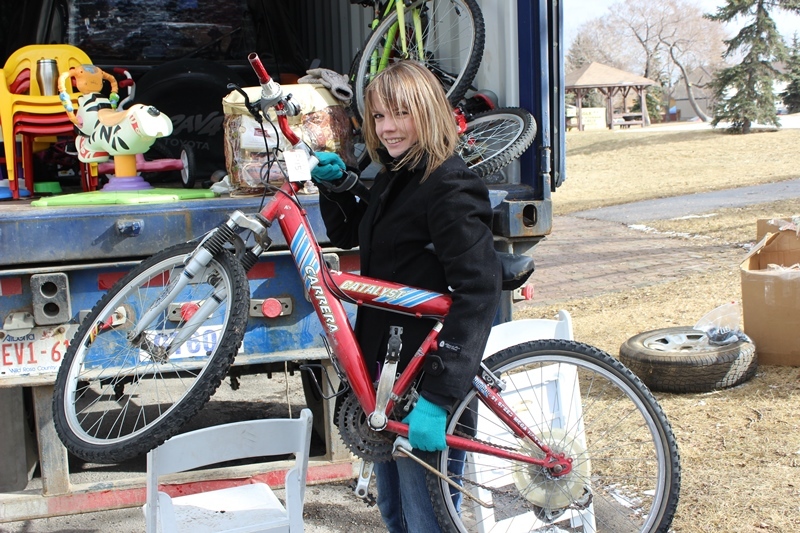 We will recycle, reuse, re-home, and donate items that are in good condition. It’s about finding treasures throughout all of Calgary and lifting the entire community. We believe in clean living and not living a wasteful life. We will not send just anyone to pick up your junk. We are highly experienced within the junk hauling and recycling business, and use only the most professional individuals to work with you. When removing items from your place, we will show up on time, in our uniforms, and work in a friendly and efficient manner. If you are not there, do not worry, we will respect your property and ensure we leave it safe and secure. Giving back to people in our community and across the globe is so important to us. As such, we have partnered with different non-profits to donate your good conditioned “junk” to. Get to know us more. Contact us today to learn about where your good condition junk will go! Changing the Junk Removal Industry for Good! Junk hauling, removal and recycling is not a new industry, but it is one that can make a difference to the community. Led by John Nicholby, founder of YYC Junk Removal, the junk removal industry is seeing how one person’s junk, can truly be another person’s treasure! John and Kristine posing in front of a shipping container full of donatable items from customers. Many of the things we find that are still in good condition go to help people in need in Calgary. Originally from the Sunshine Coast, BC. but doesn’t like yam fries. Sometimes has trouble comprehending -30◦C weather…clearly not a born and raised Albertan. Worked in the Canadian Oil Sands prior to working in the junk hauling and recycling biz. Was surprised to discover that he enjoys sorting through junk…it’s like a treasure hunt everyday! Kristine brings a unique insight into YYC Junk Removal. As John’s partner, Kristine runs the online side of the company. Born and raised Calgarian, thus begins to wither without the bright winter sunlight. Is an avid twicher (bird watcher) with a fondness for chickadees and nuthatches. Enjoys trying and creating new dishes to eat. Unique favourite vacation spot is the Albania Riviera. 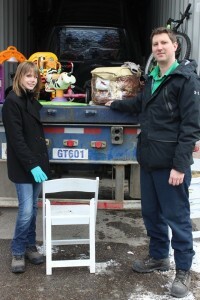 Get to know John and Kristine, along with the rest of the YYC Junk Removal team today. Contact us, or book a junk removal appointment!